Merera, C., G. Abebe, A. Sebsibe, and A. L Goetsch. 2010. “Effects And Interactions Of Origin Of Sheep In Ethiopia (Highland Vs Lowland Areas), Feeding And Lengths Of Rest And Feeding On Harvest Measures”. Journal Of Applied Animal Research 37 (1). Journal Of Applied Animal Research: 33 - 42. doi:10.1080/09712119.2010.9707090. http://www.tandfonline.com/doi/abs/10.1080/09712119.2010.9707090. Goetsch, A. L, T. A Gipson, A. R Askar, and R. Puchala. 2010. “Invited Review: Feeding Behavior Of Goats”. Journal Of Animal Science 88 (1). Journal Of Animal Science: 361 - 373. doi:10.2527/jas.2009-2332. http://www.journalofanimalscience.org/cgi/doi/10.2527/jas.2009-2332. Chen, S.X., J.Z. Wang, J.S. Van Kessel, F.Z. Ren, and S.S. Zeng. 2010. “Effect Of Somatic Cell Count In Goat Milk On Yield, Sensory Quality, And Fatty Acid Profile Of Semisoft Cheese”. Journal Of Dairy Science 93 (4). Journal Of Dairy Science: 1345 - 1354. doi:10.3168/jds.2009-2366. http://linkinghub.elsevier.com/retrieve/pii/S0022030210001074. Beker, A., T. A Gipson, R. Puchala, A. R Askar, K. Tesfai, G. D Detweiler, A. Asmare, and A. L Goetsch. 2010. “Energy Expenditure And Activity Of Different Types Of Small Ruminants Grazing Varying Pastures In The Summer”. Journal Of Applied Animal Research 37 (1). Journal Of Applied Animal Research: 1 - 14. doi:10.1080/09712119.2010.9707086. http://www.tandfonline.com/doi/abs/10.1080/09712119.2010.9707086. Tovar-Luna, I., R. Puchala, T.A. Gipson, G.D. Detweiler, L.J. Dawson, T. Sahlu, A. Keli, and A.L. Goetsch. 2011. “Effects Of Night-Locking And Stage Of Production On Forage Intake, Digestion, Behavior, And Energy Utilization By Meat Goat Does Grazing Grass/legume Pasture”. Livestock Science 140 (1-3). Livestock Science: 225 - 245. doi:10.1016/j.livsci.2011.03.034. http://linkinghub.elsevier.com/retrieve/pii/S1871141311001417http://api.elsevier.com/content/article/PII:S1871141311001417?httpAccept=text/xmlhttp://api.elsevier.com/content/article/PII:S1871141311001417?httpAccept=text/plain. Helal, A., R. Puchala, G. D Detweiler, T. A Gipson, T. Sahlu, and A. L Goetsch. 2011. “Effects Of Restricted Feed Intake On Heat Energy By Different Goat Breeds”. Journal Of Animal Science 89 (12). Journal Of Animal Science: 4175 - 4187. doi:10.2527/jas.2011-3907. http://www.journalofanimalscience.org/cgi/doi/10.2527/jas.2011-3907. Zhang, X.Y., H.Y. Guo, L. Zhao, W.F. Sun, S.S. Zeng, X.M. Lu, X. Cao, and F.Z. Ren. 2011. “Sensory Profile And Beijing Youth Preference Of Seven Cheese Varieties”. Food Quality And Preference 22 (1). Food Quality And Preference: 101 - 109. doi:10.1016/j.foodqual.2010.08.007. http://linkinghub.elsevier.com/retrieve/pii/S0950329310001400. Wang, Fang, Xiaoying Zhang, Jie Luo, Huiyuan Guo, Steve S Zeng, and Fazheng Ren. 2011. “Effect Of Proteolysis And Calcium Equilibrium On Functional Properties Of Natural Cheddar Cheese During Ripening And The Resultant Processed Cheese”. Journal Of Food Science 76 (3). Journal Of Food Science: E248 - E253. doi:10.1111/j.1750-3841.2011.02085.x. http://doi.wiley.com/10.1111/j.1750-3841.2011.02085.x. Tovar-Luna, I., R. Puchala, T. Sahlu, H. C Freetly, and A. L Goetsch. 2011. “Effects Of Level Of Feeding On Energy Utilization By Angora Goats”. Journal Of Animal Science 89 (1). Journal Of Animal Science: 142 - 149. doi:10.2527/jas.2010-3054. http://www.journalofanimalscience.org/cgi/doi/10.2527/jas.2010-3054. Puchala, R., A.K. Patra, G. Animut, T. Sahlu, and A.L. Goetsch. 2011. “Effects Of Feed Restriction And Realimentation On Mohair Fiber Growth And Tissue Gain By Growing Angora Goats”. Livestock Science 138 (1-3). Livestock Science: 180 - 186. doi:10.1016/j.livsci.2010.12.022. http://linkinghub.elsevier.com/retrieve/pii/S1871141311000047. Merkel, R.C., and T.A. Gipson. 2011. 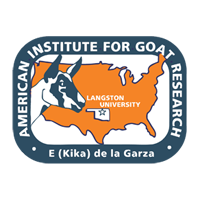 “Change In Behavior Of Goat Producers After On-Line Training In Herd Health Practices”. Small Ruminant Research 98 (1-3). Small Ruminant Research: 31 - 34. doi:10.1016/j.smallrumres.2011.03.013. http://linkinghub.elsevier.com/retrieve/pii/S0921448811000885. Goetsch, A.L., S.S. Zeng, and T.A. Gipson. 2011. “Factors Affecting Goat Milk Production And Quality”. Small Ruminant Research 101 (1-3). Small Ruminant Research: 55 - 63. doi:10.1016/j.smallrumres.2011.09.025. http://linkinghub.elsevier.com/retrieve/pii/S0921448811003749. Goetsch, A.L., R.C. Merkel, and T.A. Gipson. 2011. “Factors Affecting Goat Meat Production And Quality”. Small Ruminant Research 101 (1-3). Small Ruminant Research: 173 - 181. doi:10.1016/j.smallrumres.2011.09.037. http://linkinghub.elsevier.com/retrieve/pii/S0921448811003865. Asmare, A., R. Puchala, K. Tesfai, G.D. Detweiler, L.J. Dawson, A.R. Askar, T. Sahlu, Z. Wang, and A.L. Goetsch. 2011. “Effects Of Small Ruminant Type And Restricted Protein Intake On Metabolism”. Small Ruminant Research 98 (1-3). Small Ruminant Research: 111 - 114. doi:10.1016/j.smallrumres.2011.03.027. http://linkinghub.elsevier.com/retrieve/pii/S0921448811001027. Wallie, M., Y. Mekasha, M. Urge, G. Abebe, and A.L. Goetsch. 2012. “Effects Of Form Of Leftover Khat (Catha Edulis) On Feed Intake, Digestion, And Growth Performance Of Hararghe Highland Goats”. Small Ruminant Research 102 (1). Small Ruminant Research: 1 - 6. doi:10.1016/j.smallrumres.2011.07.014. http://linkinghub.elsevier.com/retrieve/pii/S0921448811002707http://api.elsevier.com/content/article/PII:S0921448811002707?httpAccept=text/xmlhttp://api.elsevier.com/content/article/PII:S0921448811002707?httpAccept=text/plain. Hu, W., T.A. Gipson, S.P. Hart, L.J. Dawson, T. Sahlu, and A.L. Goetsch. 2012. “Optimum Duration Of Performance Testing For Growth Rate, Feed Intake, And Feed Efficiency In Growing Boer Bucks”. Small Ruminant Research 104 (1-3). Small Ruminant Research: 114 - 121. doi:10.1016/j.smallrumres.2011.09.047. http://linkinghub.elsevier.com/retrieve/pii/S092144881100397X. Mohammed, Seid, Mengistu Urge, Getachew Animut, Kassahun Awigechew, Girma Abebe, and Arthur Louis Goetsch. 2012. “Effects Of Level Of Concentrate Supplementation On Growth Performance Of Arsi-Bale And Boer × Arsi-Bale Male Goats Consuming Low-Quality Grass Hay”. Tropical Animal Health And Production 44 (6). Tropical Animal Health And Production: 1181 - 1189. doi:10.1007/s11250-011-0056-2. http://link.springer.com/10.1007/s11250-011-0056-2http://www.springerlink.com/index/pdf/10.1007/s11250-011-0056-2. Asmare, A., R. Puchala, K. Tesfai, G.D. Detweiler, L.J. Dawson, A.R. Askar, T. Sahlu, and A.L. Goetsch. 2012. “Effects Of Small Ruminant Type And Level Of Intake On Metabolism”. Small Ruminant Research 102 (2-3). Small Ruminant Research: 186 - 190. doi:10.1016/j.smallrumres.2011.08.003. http://linkinghub.elsevier.com/retrieve/pii/S0921448811002987http://api.elsevier.com/content/article/PII:S0921448811002987?httpAccept=text/xmlhttp://api.elsevier.com/content/article/PII:S0921448811002987?httpAccept=text/plain. Goetsch, A.L., G.D. Detweiler, R. Puchala, T. Sahlu, and T.A. Gipson. 2012. “Conditions To Test Electric Fence Additions To Cattle Barb Wire Fence For Goat Containment”. Journal Of Applied Animal Research 40 (1). Journal Of Applied Animal Research: 43 - 55. doi:10.1080/09712119.2011.627135. http://www.tandfonline.com/doi/abs/10.1080/09712119.2011.627135.